Grown from seed by Pontus Wallsten of Switzerland, he reported this little guy was hit by a thunderstorm in the middle of a prolonged hit by a heat wave when coming into flower and was in rough shape. He related this bulb was imported from Chen Yi as seed, as at the time, bulbs were not available. Sadly the bulb was lost that winter which is typical of this variant. In nature it is found growing among rhododendrons which protect them from last frosts. A cold and wet winter will spell its doom. This June bloomer in nature is found at around 8,000 feet. Photo copyright Pontus Wallst�n of Switzerland. Used with permission. Pontus has an excellent book titled 'The Lily Species and their bulbs' and he can be contacted by email at pontus.wallsten@bluewin.ch for more information. 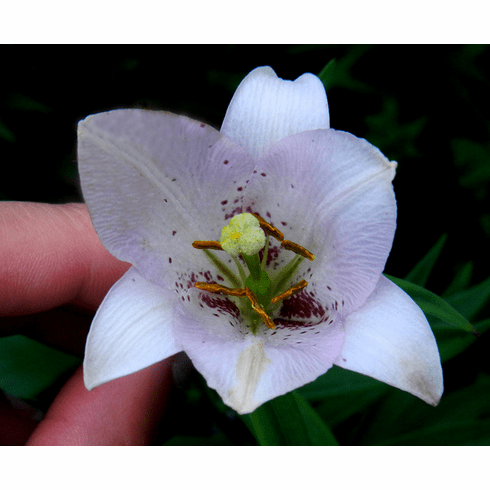 He also offers some rare species lilies in limited quantities that are shipped from his nursery in Switzerland.